Glenda and I had planned to spend half a day in Warwick Castle. We’d been told that it was expensive but as entry was covered on the Great British Heritage Pass, we didn’t have to worry about the cost. We entered the castle about 5 minutes before a guided tour started, so joined the crowd and waited. 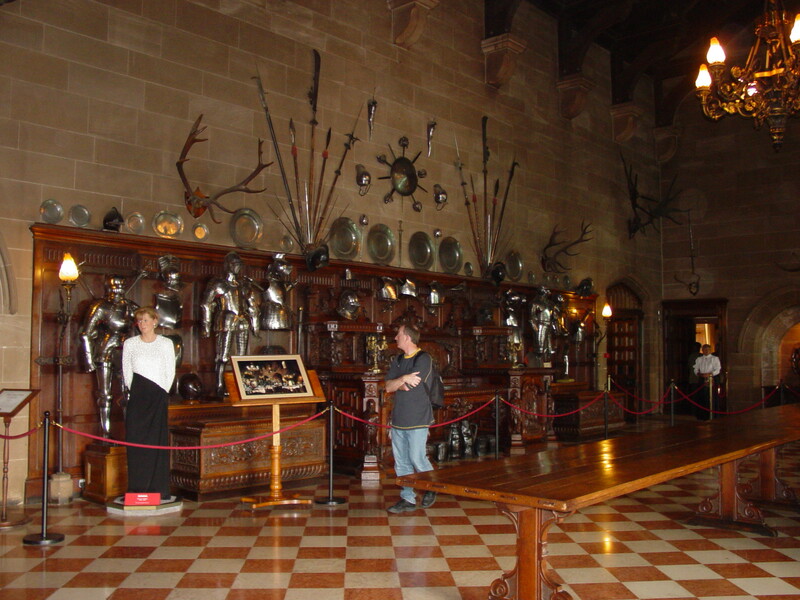 The tour started in the Chapel, wandered down to the dining room, then went back to the Great Hall. We sashayed past the wax Lady Di, everyone else started to admire the sideboard made for Vickie and Albert. Not me. There on the floor were two of the largest bombards I’d ever seen. Yum. Glenda dragged me along with the group as we investigated the wing of the castle [knowing we could go back again – honest! G.] At the conclusion we collared the guide and played “20 Questions”. She humoured me for nearly 20 minutes, then ducked off and found a copy of the guide manual. The Great Hall of Warwick Castle. 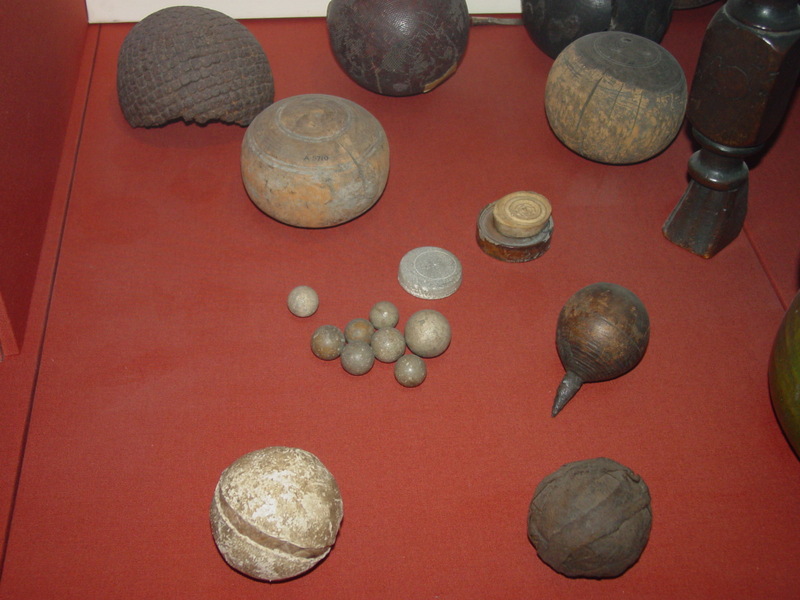 From the left: A wax Lady Di; the real Wayne (or possibly the other way around) looking at rivet patterns on 17th century pikemen’s armour and; on the floor, several leather vessels they didn’t know where else to put. 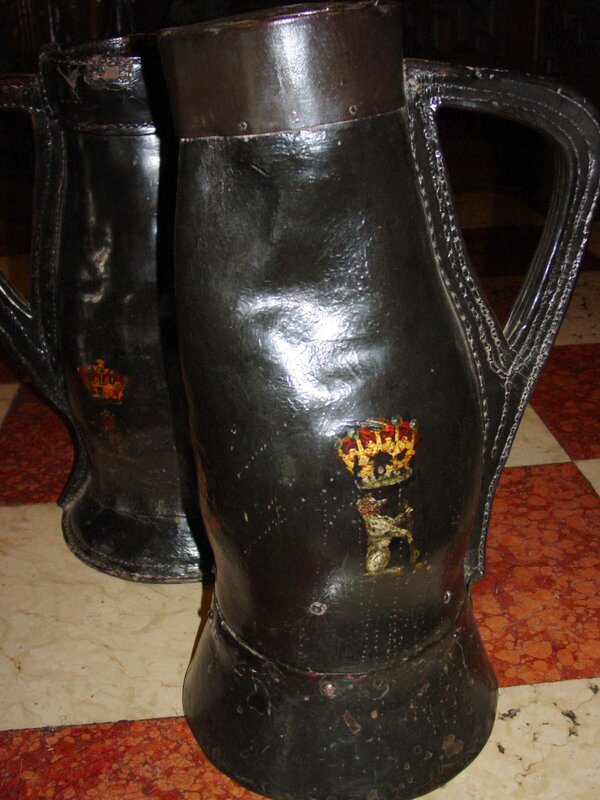 Until the late 17th century jacks and bombards as a rule have triangular shaped handles attaching at the top of the body and are flat near the top of the vessel and have a smaller mouth. 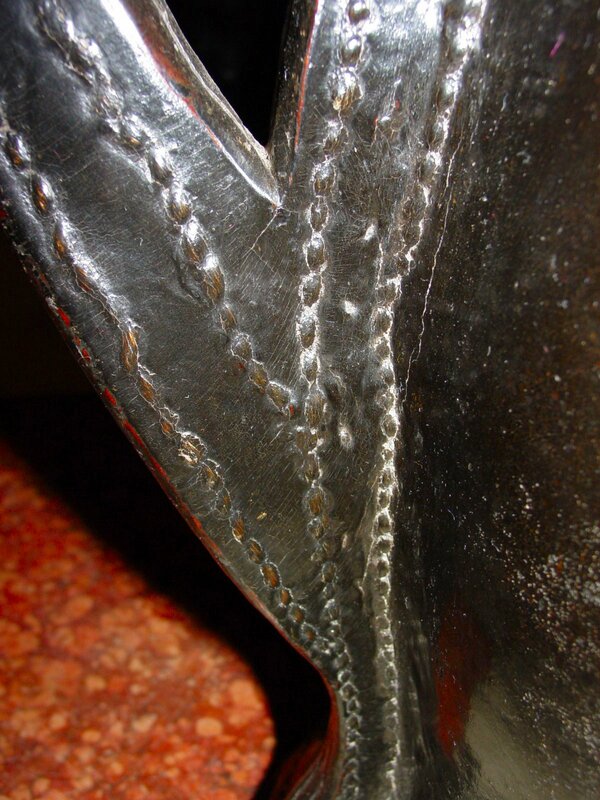 After the 17th century, the handles become more curved and attach lower down the body. 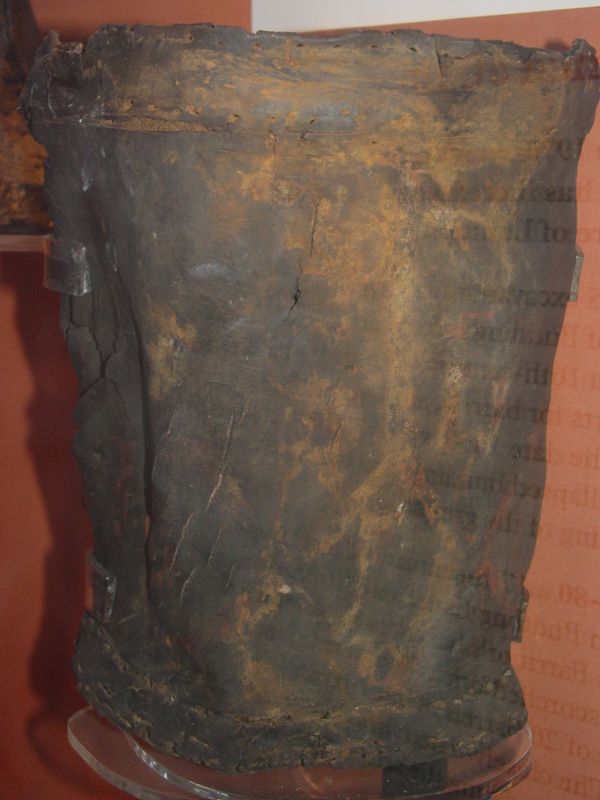 The mouth of the vessel is wider from the 18th century onwards. 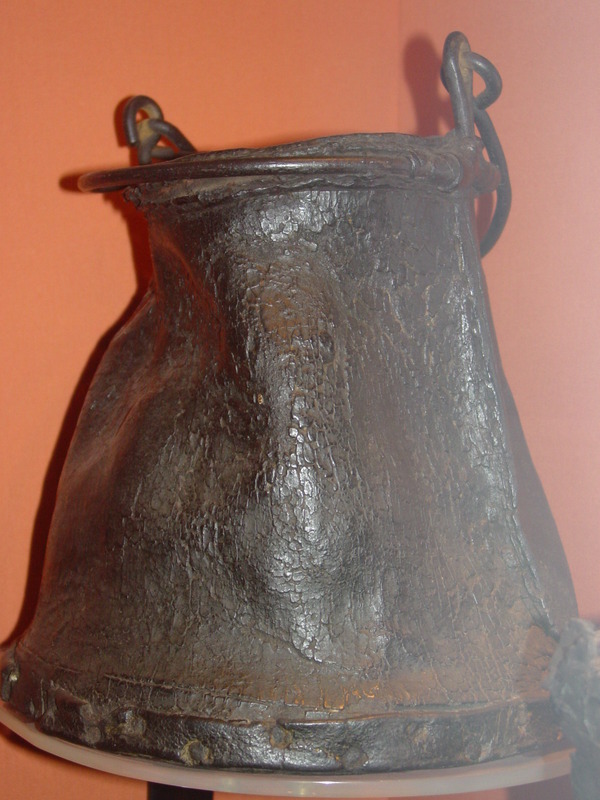 These two show reinforcing attached to the top, one in leather and the other in metal (possibly pewter), probably done at different times. 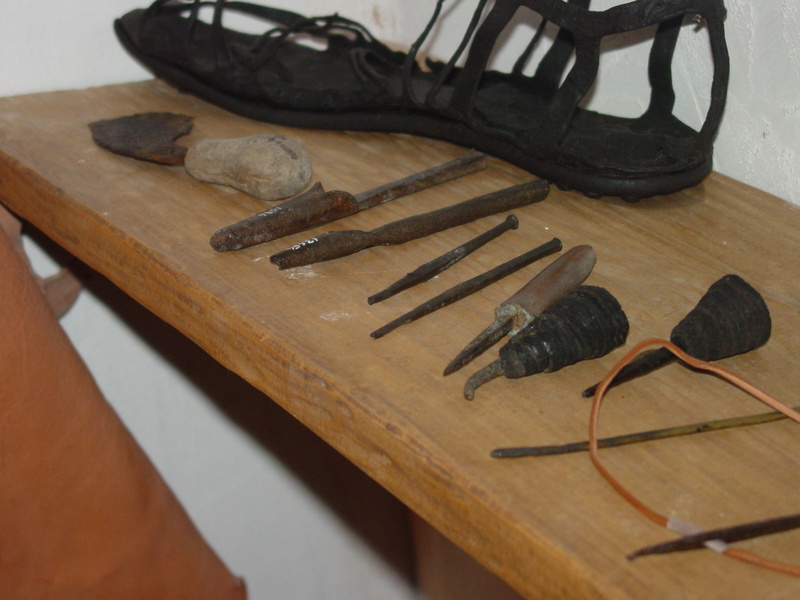 There was some evidence of a metal handle being added to the top of leather reinforced one at some stage, but it has long gone. 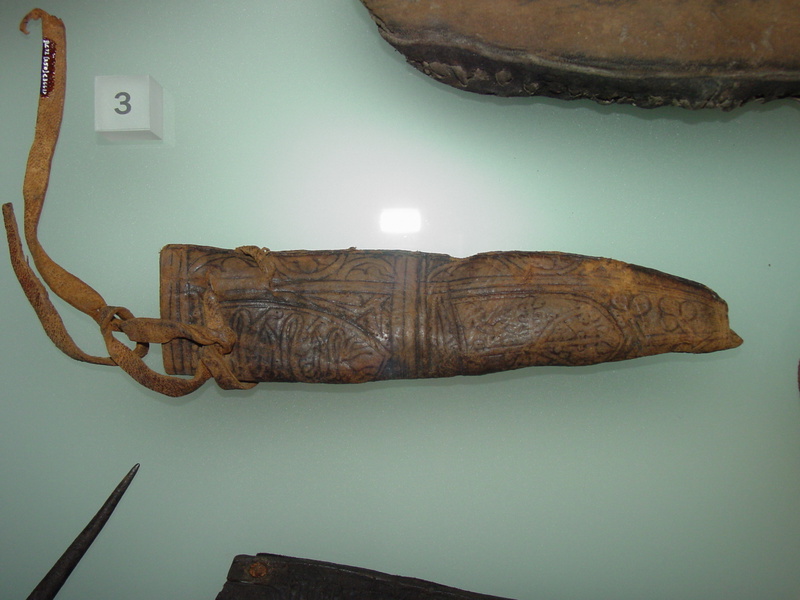 The leather was about 3mm thick, with three additional layers in the handle and one gasket strip in the base. Stitching is heavy linen, six stitches to the inch. 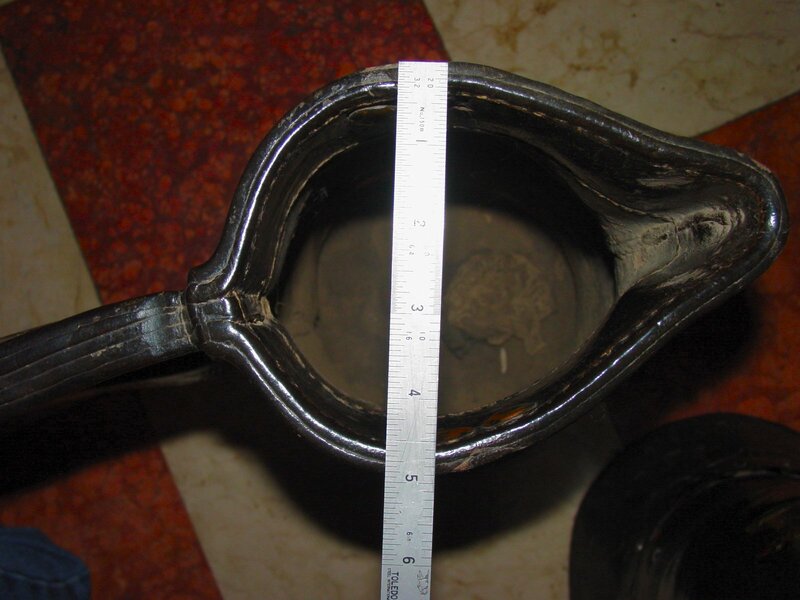 Height is about 20”; diameter at the neck is 5” and 12” at the base. The guide’s manual states that the bombards belonged to the Grevilles, who were made Earls of Warwick in 1759. Based on the Greville crest being shown with a coronet, they had decided that the bombards were made for the occasion and therefore dated to 1759. I pointed out the coronet was in obviously newer paint to the crest and stylistically, these bombards belong to the 17th century! Unfortunately, no one could provide any more help but they did recommend other parts of the castle that we may be interested in. The smaller bombard. 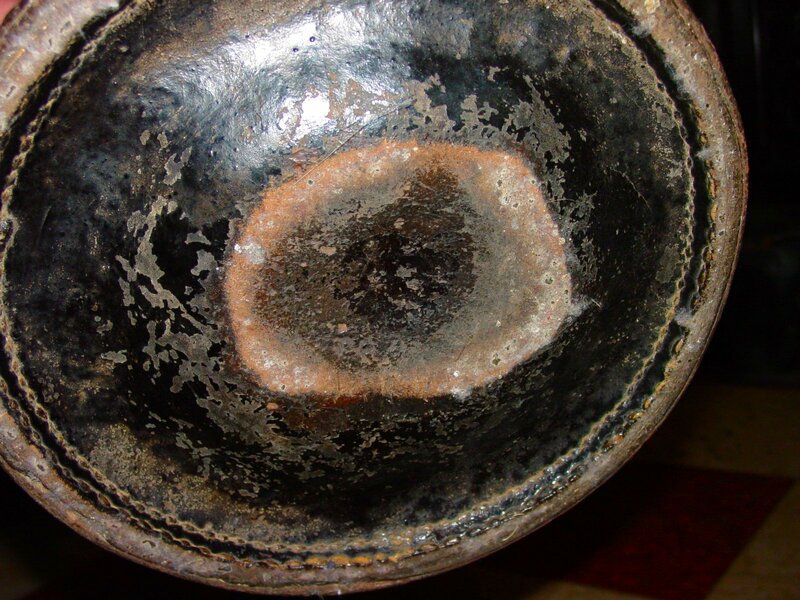 Note how the coronet is in relatively good condition when compared with the device below which is mostly illegible. 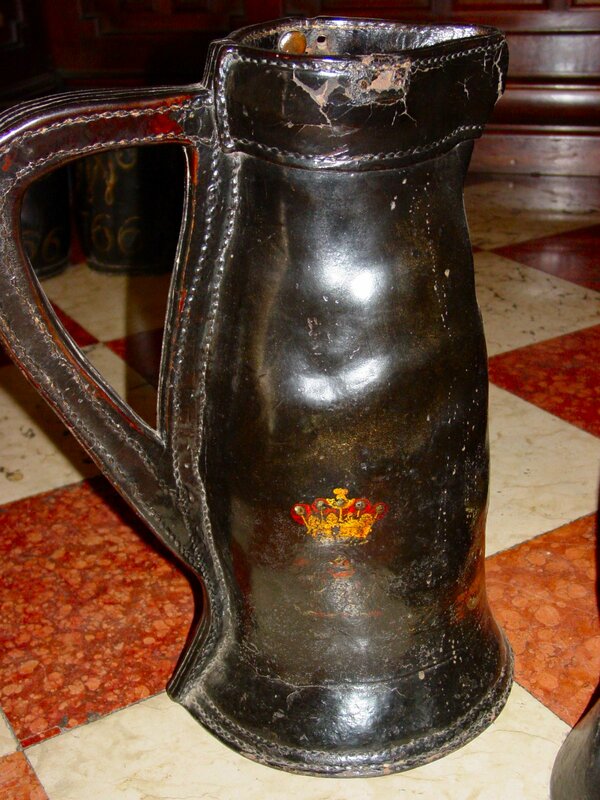 The leather bucket in the background bears the date 1766. The larger bombard. The Warwick badge is in similar condition to the coronet. This is consistent with both being applied in 1759, the year the Grevilles were made earls of Warwick. 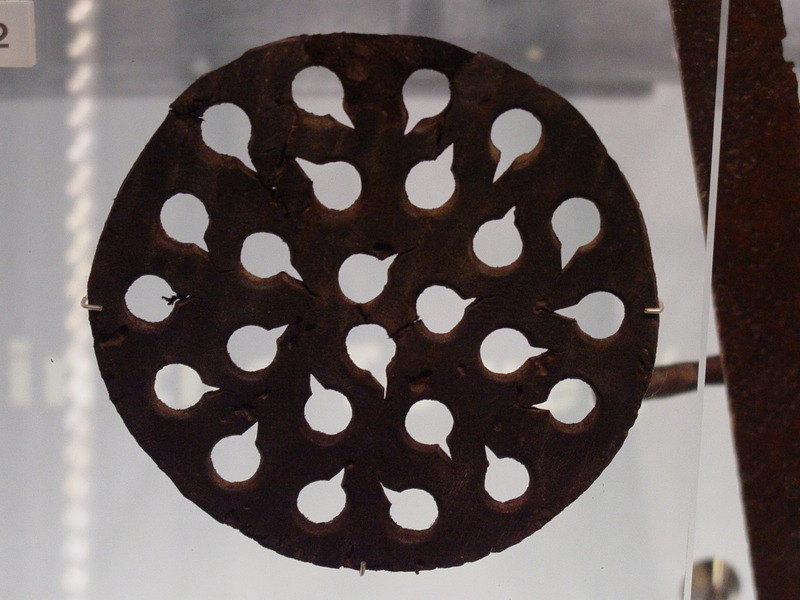 Top view of the smaller bombard. The rule shows 3mm leather for the body, a single 4mm gasket strip down the back seam and four layers in the handle. The repair around the mouth is in 1mm leather. Intersection of the handle and body on the smaller bombard. Note the irregularity in the stitch lines. The angle of the cut on the inside of the handle leads me to believe that the handle is cut after the stitching was done. The base of the smaller bombard. Two rows of parallel stitches are shown, about 4mm apart at a pitch of 6 stitches to the inch. 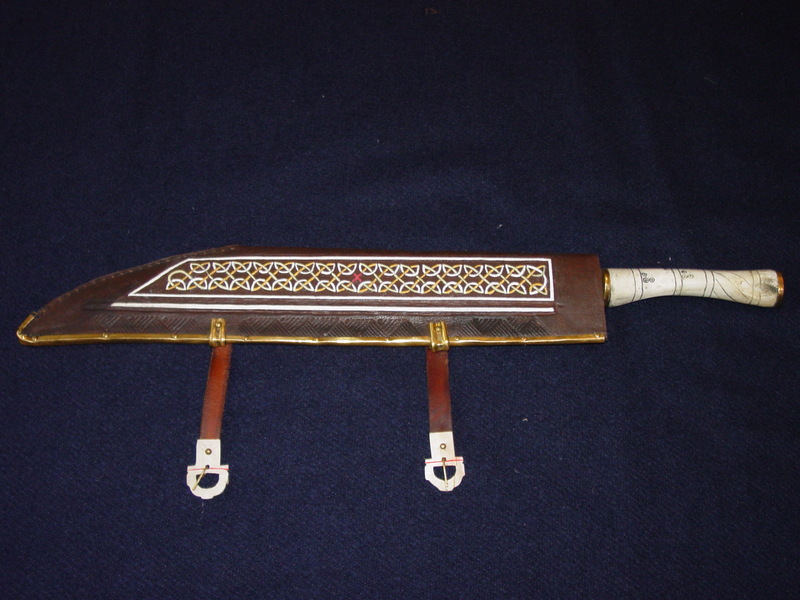 Detail of the neck reinforcement on the smaller bombard. 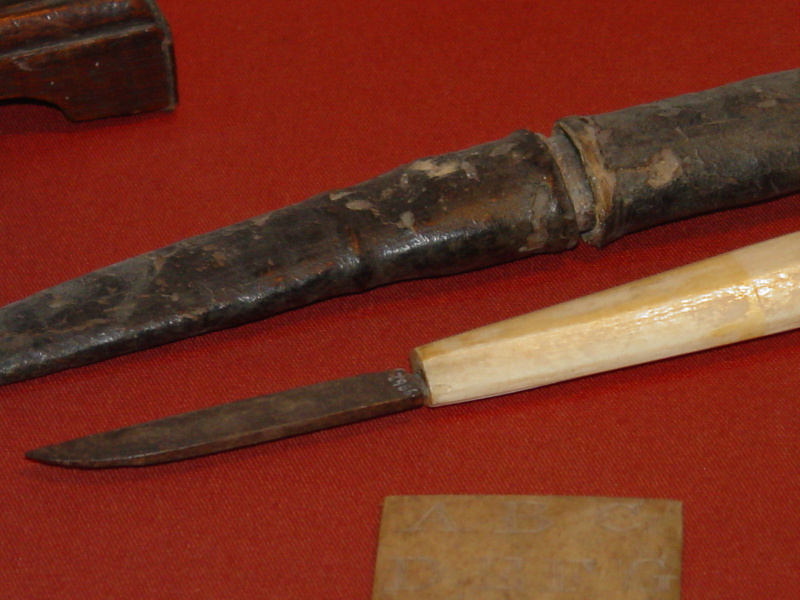 The larger one has a metal collar of later date. This is a topic I don’t think anyone’s covered particularly well, so I’m going to have a crack at it. 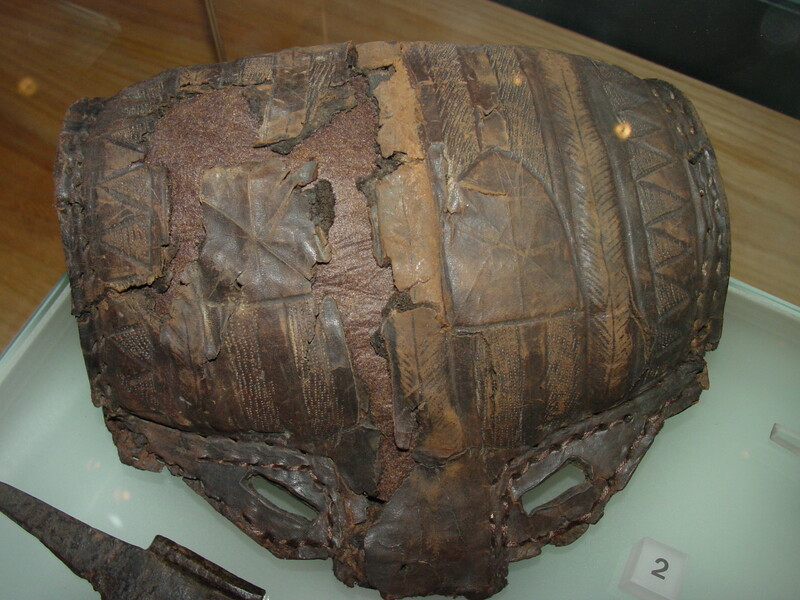 A lot of extant leatherwork from the early medieval period through to the modern period exhibits traces and in some cases, complete painted decoration. Some good examples are the Stonyhurst Gospels (http://en.wikipedia.org/wiki/Stonyhurst_Gospel), the saex scabards at Jorvic and the Yorkshire Museum and the leather jacks in Warwick Castle. 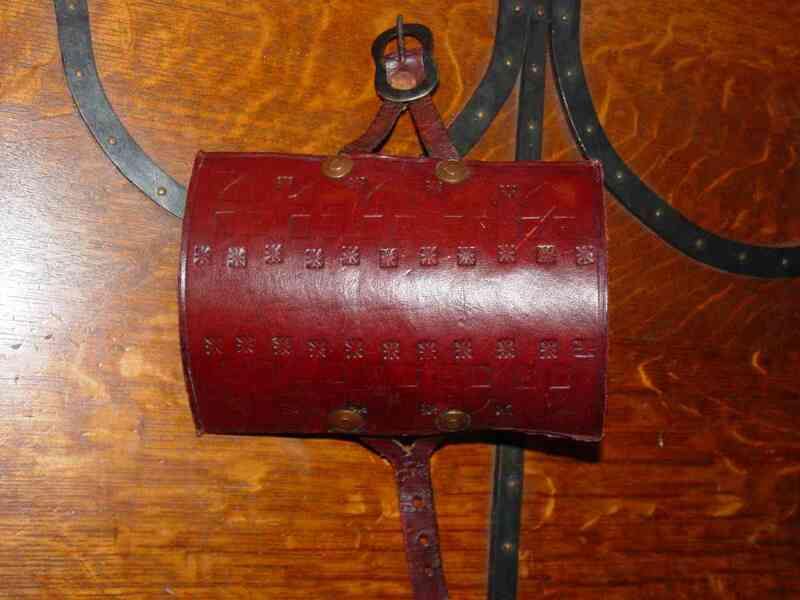 Looking through surviving Tudor and Stuart leatherwork that’s in original condition, almost all buckets, bombards and jacks have at least the date painted on them. Appropriate paints include tempera, gouache and oils. The selection of paint depends on the period being represented by the object. Tempera predates Egypt, and was still commonly used until superceded in about 1500. Gouache paints were in use in the early 1400s in mainland Europe and probably migrated into the UK shortly after. The name originally applied to a completely different paint, taking it’s modern form in the 19th century. Contrary to many claims about a much later date of invention, Theophilus, writing in the early12th century disussed the preparation and use of oil paints using linseed oil as the medium and rosin as the binder (Book 1, Chapter 25). I suspect the Warwick jacks are crested with an oil-based paint. More relevant to us here, he also gave a couple of recipes for a varnish made from linseed and rosin (Book 1, Chapter 20). Each of the types of paint have their pros and cons, oil paints are easy to use and waterproof when dry, but dry slowly and continue to oxidise and darken as they age. You’ll need to use at least three coats to get any colour density. Gouaches are better at covering than oils, and dry quickly, but aren’t waterproof when dry. I usually thin with a few drops of gum arabic to improve water resistance and then compensate by doing two coats. Tempera is hard to get unless you grind and mix your own, it has most of the benefits of gouache but is often fugitive. Purists may skip this next section while we discuss modern paints. Art quality acrylics work wonderfully over large areas or in places where the object is likely to get wet: I use acrylics for objects used by kids due to the wearing properties and water resistance. The bigest benefit is flexibility – acrylics can be used on soft items or things that have a bit of spring without flaking. Acrylics aren’t capable of flowing the way gouaches and oils do, so don’t suit my painting style. They also tend to bead when applied in fine lines, so can’t achieve the same clarity as gouache. Gel inks provide good coverage and can be used to provide very fine lines, so can be used to compensate for the shortcomings of acrylics. You have to have a good eye for colour to be able to match the acrylic paint with the gel. These come in pen form with a steel rolling ball, so can be used for fine lines on knotwork that would have originally been done with a steel nib or crow quill. The black comes in handy for correcting the bits where you go slightly outside the lines. Modern enamels are a pigment in a synthetic oil base. I’ve never tried them on leather, if you have, let me know how they go. I can’t see any reason why they wouldn’t work, but may be a bit brittle on flexible objects. Metal foils and leaf are a great way of highlighting detail. Use the same methods that you would for applying leaf to parchment. My sketching tends to be fussy and not suited to easily transfer to leather. For these things, I do my layouts by finding an image on the Internet or in books, bung it in a word processor and then put any text required around it. Here’s one I prepared earlier. This design was a commission for a jack for James’ birthday. 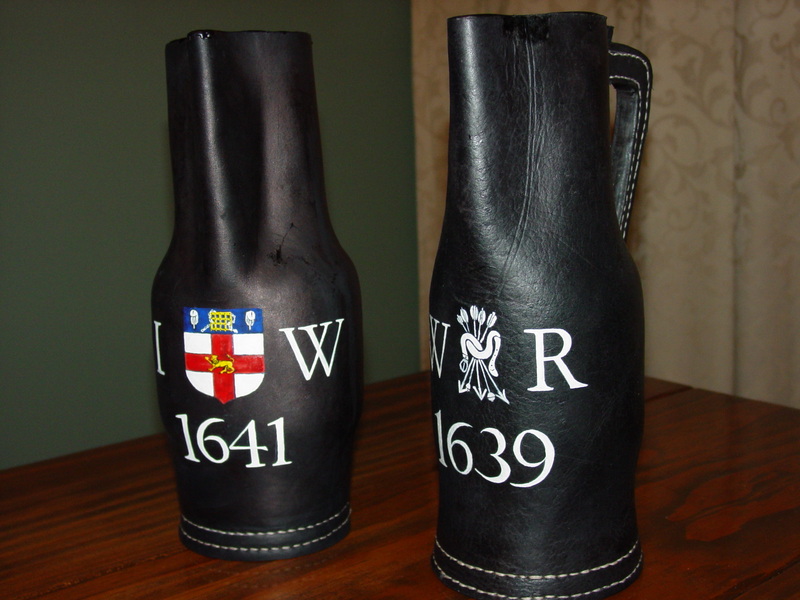 The arms in the were taken from a larger design done by Wendel Hollar for the Honorable Artillery Company in 1643. I’ve removed the supporters, the crest and the mantling. 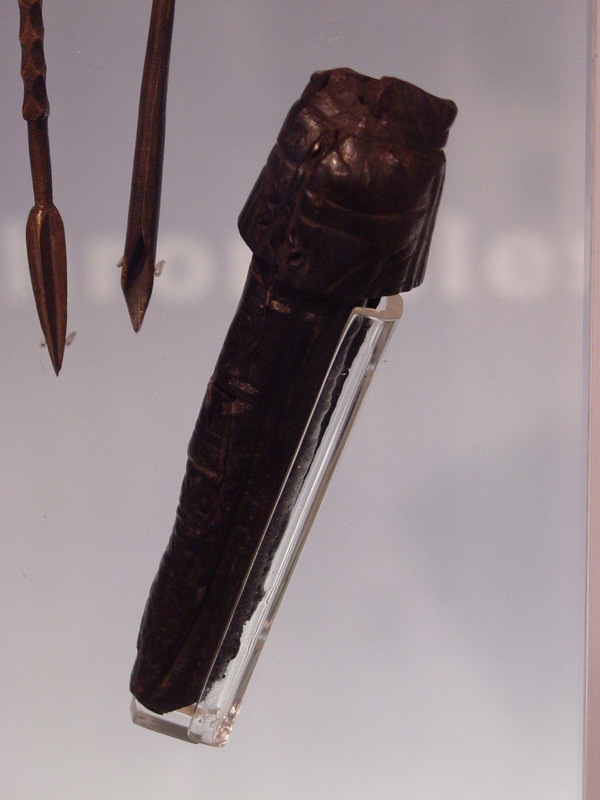 The arms are considerably older than this, but it does show the correct form during the period in question. The initials IW are used as the letter I was commonly used in place of J in the early modern period. The year 1641 is arbitrary, but as James is younger than me, it seemed appropriate that his jack showed a newer date than mine. Paint colours come from a slightly later colour print. 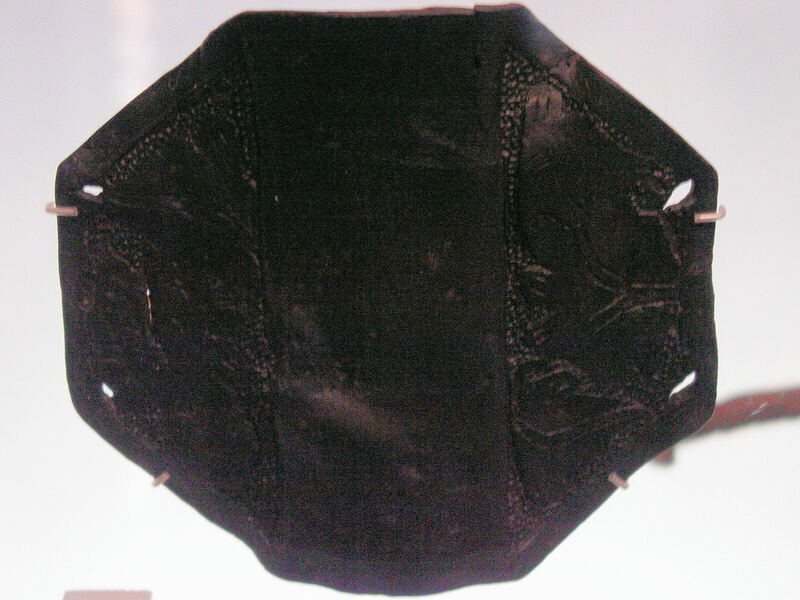 The design was printed and transfered to the leather using one of a few different techniques. If it’s a flat design painted directly on to the finished leather, I cheat and transfer the design with yellow or white “carbon” paper available from larger haberdashers – that’s why the red pen outline is on the design above. 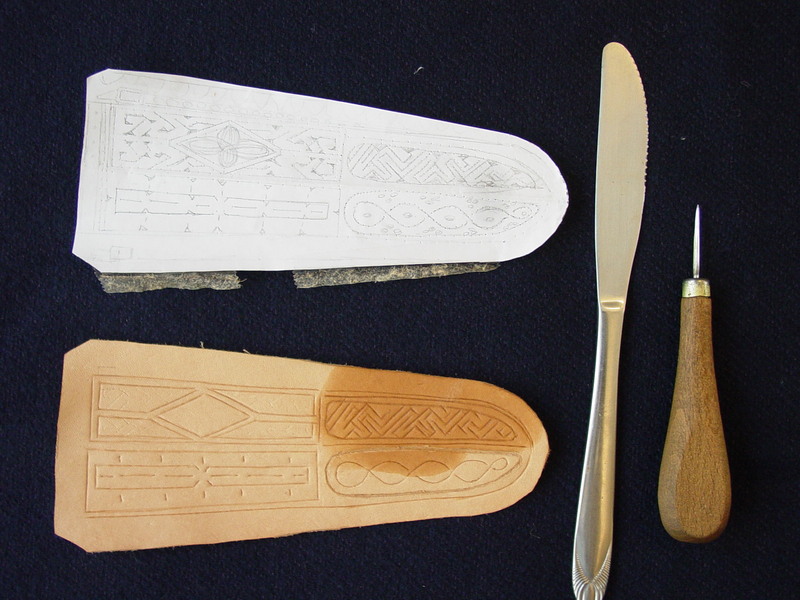 For embossed or chased designs I do the work before dyeing the leather by poking small holes along the lines with a needle or awl and after securing to the leather, rub powered charcoal or chalk through the holes, then remove the paper and join the dots before embossing, often using the back of a butter knife to start. Once the relief work is done, the leather is dyed and sewn and then painted. I didn’t end up painting the one above, but the principle is the same. Try to avoid handling the area you’ll be painting, particularly if using water based paint as the oil from your fingers will cause the paint to bead and cover unevenly. In a manner somewhat reminiscient of the Monty Python Blue Peter sketch, now paint the design. It takes some practice to get paint to flow properly on leather, particularly if the grain is particularly deep. Pick something easy to start off with and don’t be afraid to wash it all off, let it dry and have another go. Again, I look to Theophilus and varnish over the painted design. If I’m using gouache, I’ll use three or four coats of varnish to improve the water resistance and then a good coat of bees wax polish. The jack on the right in the top photo has been in use for nearly 10 years, the only time I had problems with the paint running was last Easter when it was used in a re-enactment tavern in a river valley where the humidity was always over 90%. It was continually wet for four days straight and the bottoms of the serifs started to bleed on the evening of the last day. See my earlier “Care and Feeding” for more tips on maintaining your painted leather for a good working life. Saex scabbard, loosely based on one from Jorvik. 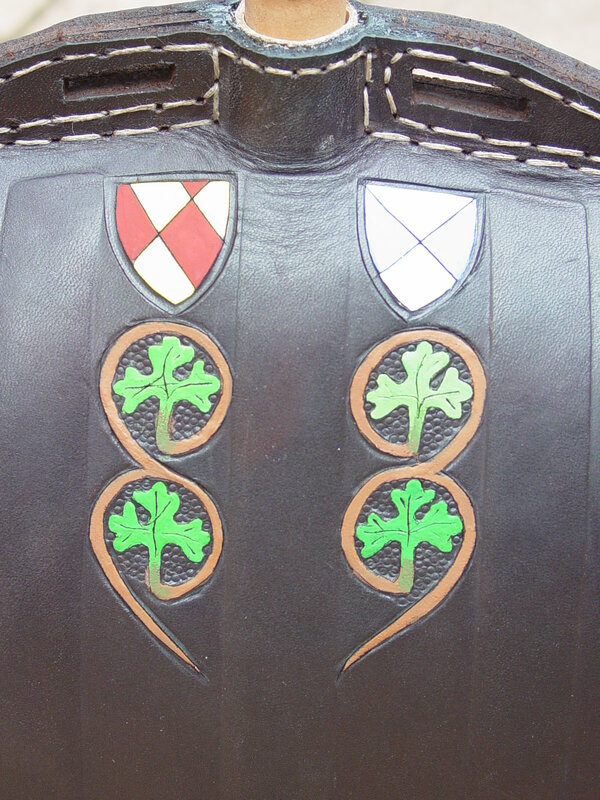 The original has much coarser knotwork but still shows paint in the same colours. Gouache on the leather, the bone has a black paste worked into the groves. 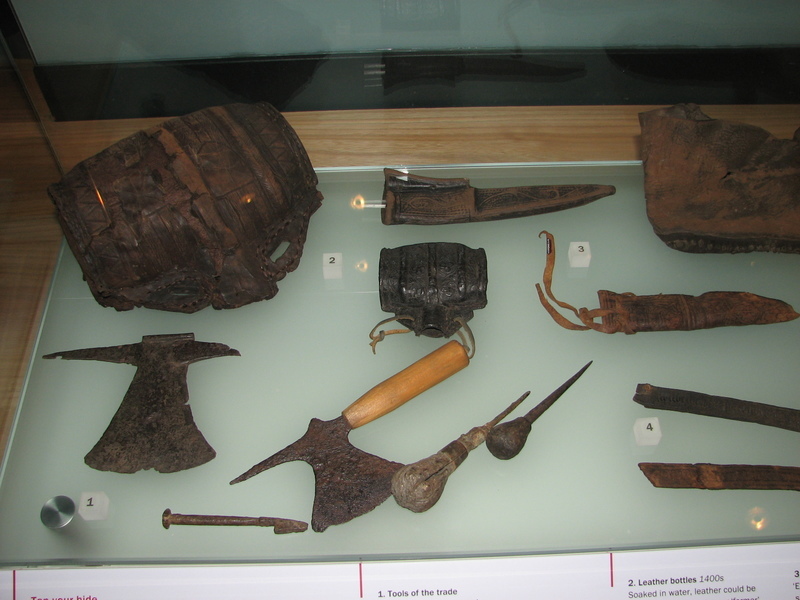 The bone buckles and hilt came from a lamb roast. 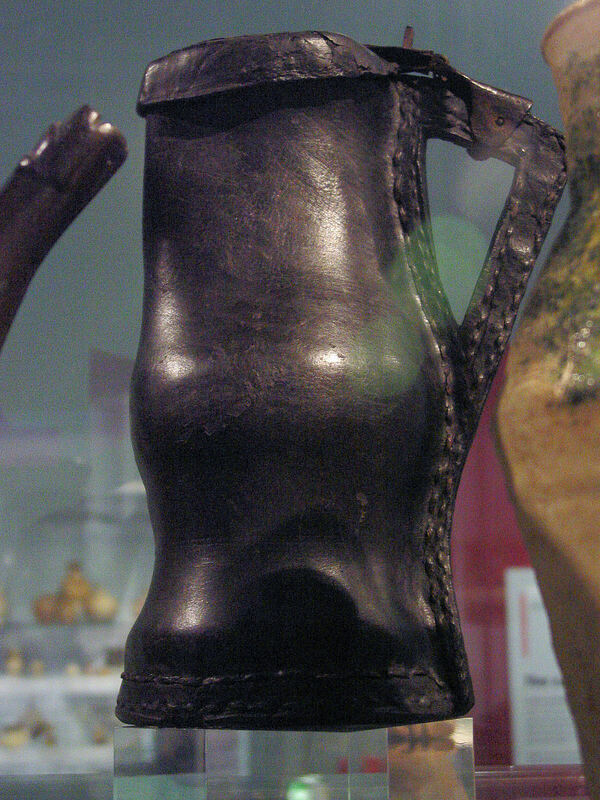 Costrel neck, in the style of one from the Mary Rose, 1545. It was to have been a copy, but I got the length wrong and had to use different shaped ends to compensate. Gouache on leather. 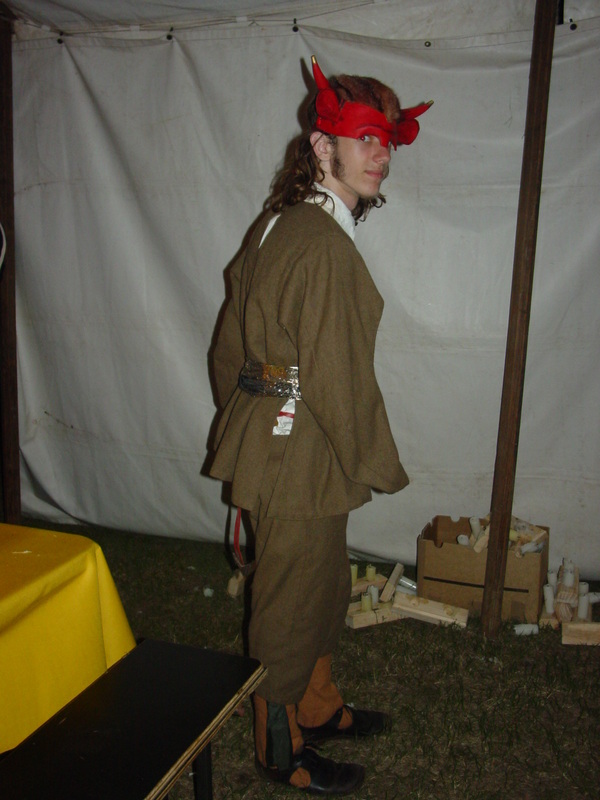 Lincoln Imp mask and tail based on the imps around Lincoln Catherdral. 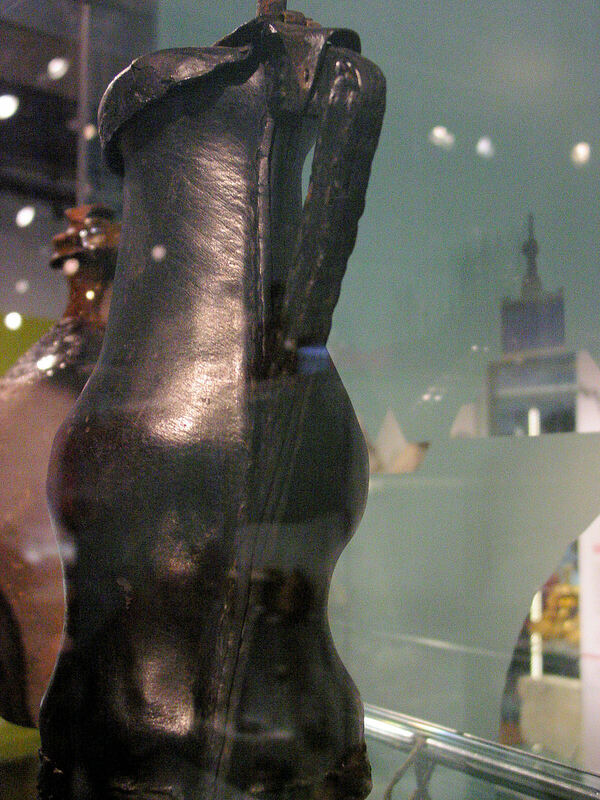 Moulded leather mask and horns, embossed ears and tail. The hair is an old fur stole. Acrylic paint and gold leaf. This is a simple multi-period project suitable for the beginner. 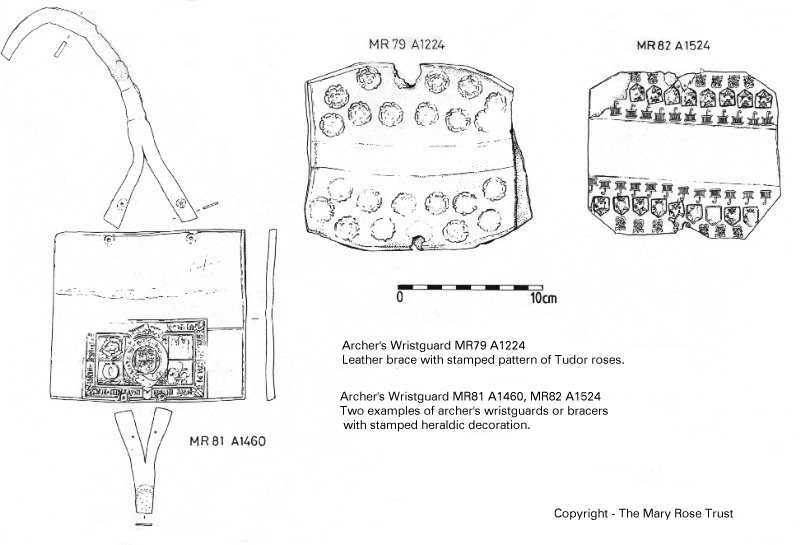 I was looking for an arm guard design that I could use for the ECW period and noticed a similarity between those shown in the woodcuts of the archers in William Neade’s The Double-Armed Man (1623) and one found on the Mary Rose. The result is a more or less shameless rip-off of the Mary Rose one, with the decoration hinting more towards a slightly later London origin. I’ve used the design of the one on the left, but based the decoration on the one on the right. Cut a rectangle of 4mm leather and two straps of 3mm leather. Split the end of the straps and dampen the intersection, then stretch to the desired shape. Decorate, stain, rivet, stitch and finish to taste. I has Alex from Talerwin Forge forge the buckle to match the one he’d made for my helmet, but a commercial one would also be fine. The pike, sloapt. W Neade, The Double Armed Man (1623). A shield stamp is dead easy to make. Not being armigerous (Google it), I decided to use the arms of the City of London in the decoration. There’s a few reasons for this, the main one that there was a regiment of archers raised in 1642 within the Cripplegate Ward, the other was that the gentleman in the woodcut above was a member of the Gentlemen of the Artillery Garden and their shield is a bugger to carve. 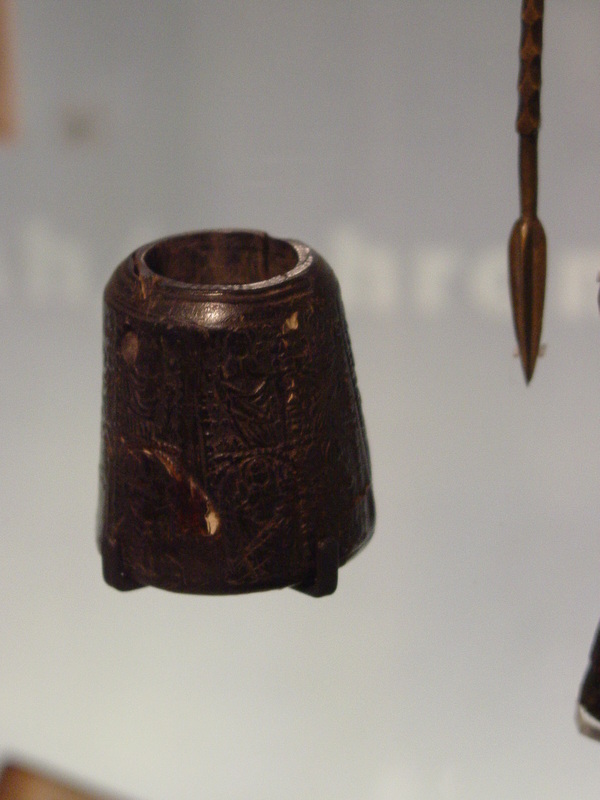 The stamp is made from a piece of Tassie Oak curtain rod. I heat hardened one face using the bench sander, then shaped the shield using files. 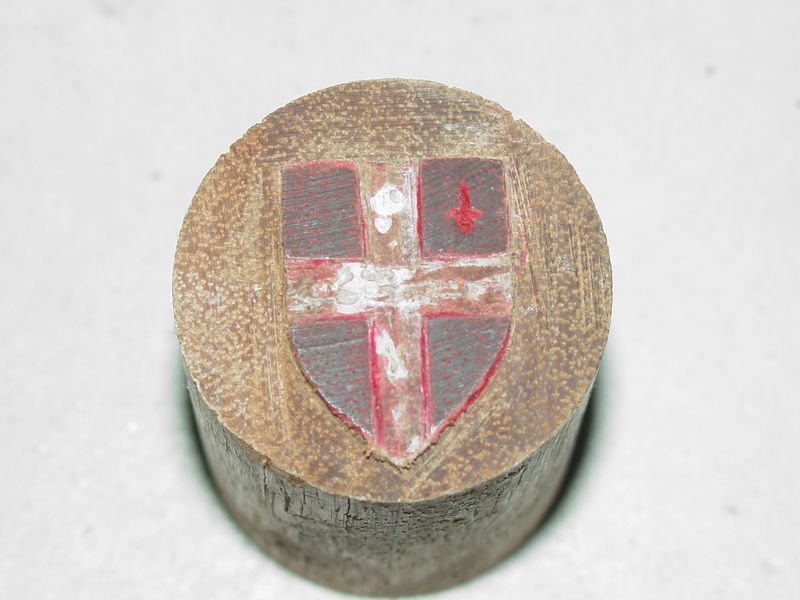 The cross was also done using a file to about half the depth and the sword with three cuts with a sharp 1/4″ chisel and a centre punch for the pommel. Wooden stamp of the arms of London. The small star/flower shapes are a commercial stamp, but could have been made with some square-stock and a file. The border is embossed with the back of a butter-knife. I’ve dyed it dark red as Roger Ascham recommends in Toxophilus, The School of Shooting (1545) that the best are of Spanish cordovan. 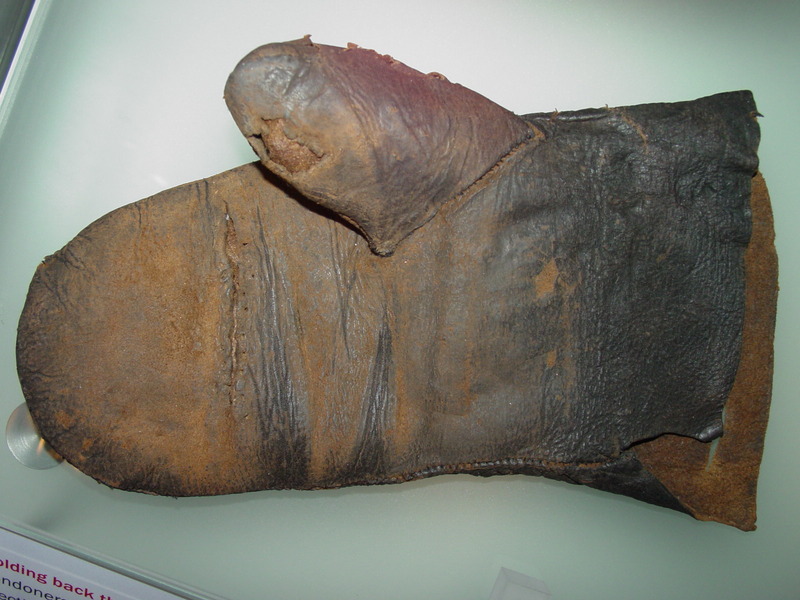 Cordovan leather is dyed red in the tanning process. Finally, rivet the buckle and the straps on and finish with a beeswax polish to seal and help the bowstring slide off. Finished and used a couple of times.